A semi truck hauling butter stopped for fuel at the Matfield Green service area around 3:45 this morning. 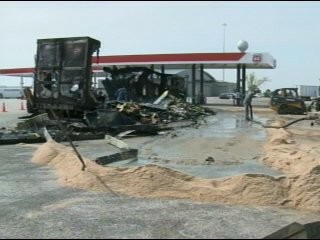 When the driver got out, he noticed a fire coming from the tire area and backed his rig away from the gas pumps. The fire spread quickly, burning up the trailer and melting butter all over the parking lot. Crews worked to clean the parking lot.